Discussion in 'Building the Classics' started by Crunchifyable, Nov 28, 2017. I have been pondering for years about building some kind of Plexi / 2204 2-in-1. But the cost of the iron and the fact I have a lot of amps already always made me put it on the backburner. 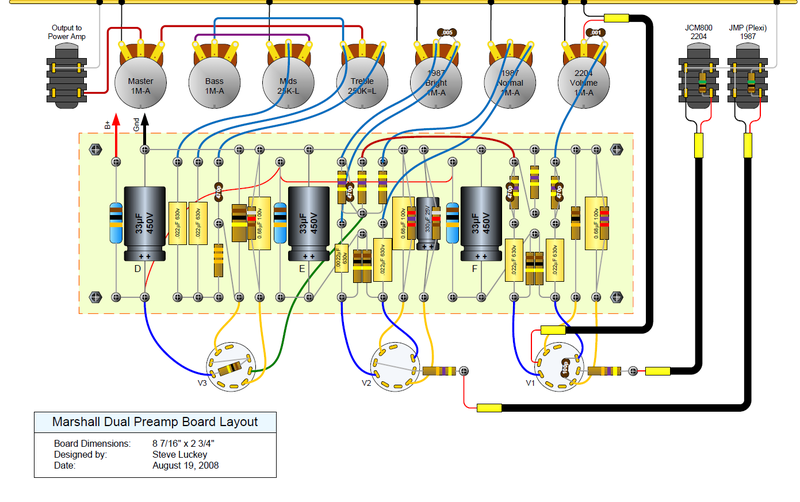 The other day I accidentally discovered these attached schematics and layouts on my PC. Have no idea where I found it, but Steve Luckey is the creator. But it's precisely what I want : a plexi and a 2203 preamp, in theory able to line out into any other power amp, or be converted into a full amp down the road if I so choose. I personally prefer just the preamp concept : it makes it useable with 5, 50, and 100w power amps. I could call it a ....Dual Super Lead ? How about a Super Lead Overdrive ? Or add a rectifier tube and call it ... Dual Rectifier? What I don't understand, and what I could use some help in, is figuring out what kind of power supply this pre-amp would need to get it to correct voltages. I assume a 1 watt power transformer would be sufficient and economical. But it would obviously need some sort of (diode) rectification to create the B+ necessary??? Here's a layout with a power amp and using a switch instead of two separate inputs. That gives me some ideas but I don't really want to bother with a full amp. I just want to build a preamp with the right voltage and a proper fuse. But I'd appreciate any insight about the power supply, or output concerns (correct impedance for an effects return?). The 2203/4 preamp on the other hand was designed to give you "plexi" type sound at any volume. look at my thread "dual loops/levels. .." in the workbench section for some ideas. I just built a floor preamp for a friend. Might be what you're after. Thanks. I'm aware the plexi preamp is pretty clean until it hits the phase inverter (unless you are boosting the front with pedals). I just figured a modular system is better because I already have an assortment of "host" power amps. Volume is never an issue for me as I attenuate when necessary. I think I probably will prefer the 2203 circuit, but I think it's a plus to have both for the tonal differences. It's two different approaches to the same thing, basically. With the plexi side I'd be running it with pedals or cleanish. I've heard of people using 12v to 220v transformers...but your solution is even better. Assuming you got no noise from the switching supply as some people thought you might? I'm glad other people are making preamps. Seems like a logical direction. I'm impressed at how compact yours is. It's making me wonder if I'm over complicating things. I always like complicated amps. Already contemplating adding separate tone stacks eventually. Is very exciting at how little this build requires. If the master volume wiper is the preamp output, the signal is too much to drive a standard device. Or make the preamp out a (second) cathode follower to drop the level. 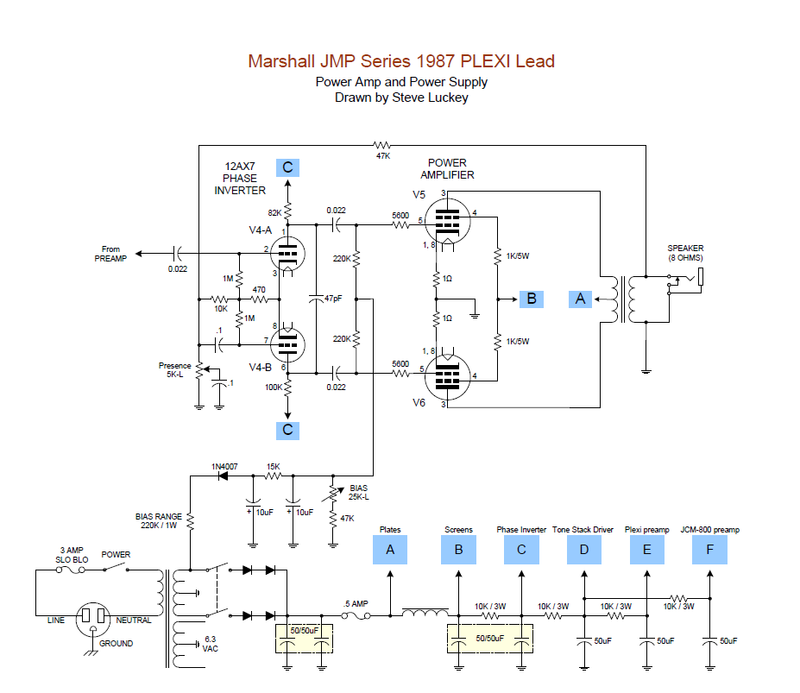 If a standard level is driving the power amp, there needs to be a buffer stage to drive the PI. If you are using the PI input as an effects return (from an effects level) there needs to be a buffer stage to drive the PI. See, effects input / output level is about 1V PtoP (it's guitar level) and that does not match your preamp out / power amp in. Your preamp out / PA in is going to be a way higher level signal. Otherwise the effects return directly into PI is too low a level. Thanks...I'll research an appropriate "effects send" schematic. Leaning towards solid state because it's what I'm used to. Or whatever is simplest and transparent. I thought of something like that but it's overkill because I don't really need a return (yet) and it's a bit pricey for what it is. I have a spare 12au7 that I could rig something up with, but I'm going to see if I can do something with a TL072 or Similar. 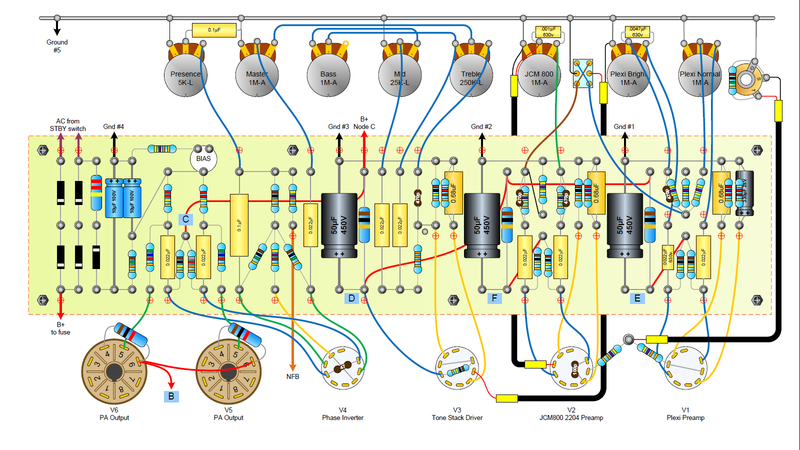 johan.b had a similar schematic using a TL072 so I'm going to try that. I'm impressed he managed to fit a 2203 preamp into a stompbox. This looks pretty easy though, I guess this is what you meant by a cathode follower yes? Gonna build this thing one piece at a time. Yeah, cathode follower is the way to go for the effects send. But solid state: you gotta build a bipolar low voltage supply. And this is difficult, because the PT has no sec winding for it. Another problem is tuning the buzz out of the AC preamp filaments, which tempts you to go w/ DC filaments for preamp. When you add those stages, the filament buzz is becoming a bigger problem. But there is a way to cancel out the buzzing. What I have been looking at is these little tiny self contained DC supplies, made by Mean Well. Very small, regulated power supplies that might be handy for adding on to guitar amps. It's a bipolar supply that costs $10. Pretty remarkable low price but very well designed. Yeah...that was my concern with anything involving ICs. Might just be easier and cheaper to go with a vacuum tube. I was kicking around the idea of using an old computer power supply to get 12vdc (or a 120 to 12 transformer), and then getting a 12vdc to 220ac step up transformer (cost $2). The problem with those "1w amp" power transformers is they cost almost as much as a real amp transformer. For just a bit more I could get the real deal big iron. 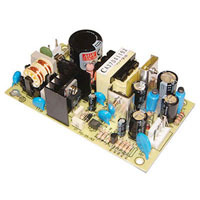 Anyone ever use Musical Power Supplies Inc? A bit cheaper than Classic Tone. If using only 12a_7 tubes, you can get away with 9VDc heaters..Marshall does on the DSL line..if you then build (our buy ) a "nixie" supply, you've got what you need for a preamp. If then using the 9 volt for a solid state loop/ output buffer, you've got enough for a solid 3.5volt output. Enough to feed any modern power amp. I would try a Fender Champ PT...or actually Super champ. It has some extra winding for a low voltage supply. I'm afraid anything made for an actual guitar amp is too expensive. So I think it's the either a "creative supply" or I find a used PT for say a 2204 / 1987 / DSL etc and drop the voltage. Sometimes I do find nice used stuff on ebay. AMS, Would a super champ PT be able to power 3-5 12a_7s? I have a 1.3a 9v wall wort with a 3v side output. But I don't think that will cut it for 3 tubes. I googled nixie but am not quite sure how they work. I understand they are for miniature processors. Could you please walk me thru how you setup your power supply on your preamps johan? Is it converting to 220 then rectified ? I just don't understand the vIn and vOut from a nixie. If I could find a board already made or a schematic that's useful for this purpose that would be awesome. Did you make yours or did you order one? The plan is to have 3 12ax7s in the preamp. Would like something that can power those 3 and possibly another 2 (a phase inverter and a 12a_7 as an output tube). I guess I could build a 12au7 Poweramp later with a different supply ... Your 1 watt plexi sounded amazing! 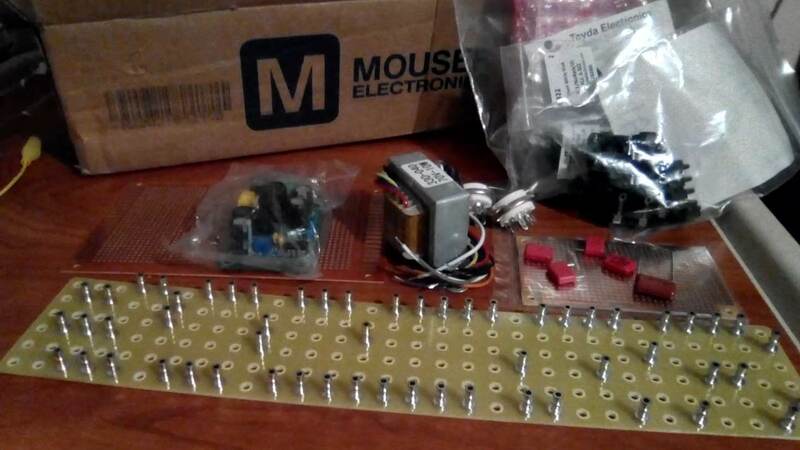 I am putting together an order from Mouser for resistors and caps. Going to buy everything necessary for a full 2204 (minus transformers) and just stash the unused components. I assume I could get a cheap nixie board from there or eBay. Already have 4 preamp tube sockets and a 2204 turret board on the way from China. This is going to be truly "one piece at a time". The nixie supply use switch mode circuitry to convert 9-12 volt dc to 200-300 volt dc. Further filtering is only needed to prevent intermodulation. They are popular in stombox builders comunities for tube boxes. You can build yourself or buy ready made module on ebay. I've used them with up to three bottles (6 tube sections). I guess you could use more but might have to choose a bigger inductor. I'll have to look for one then since that's exactly what i need. My original goal for this was for it to sit nicely on top of another head or on a desk for recording use, something cigar box sized like yours. In the long term it depends on whether I like the 1 watt mode or prefer it running into a big amp. Long term I will probably get dedicated transformers. Short term I just need to build the thing and determine if further tweaking is required. Will possibly build several (maybe a traynor clean + JVM or DSL lead split). I'm impressed at how compact yours is. . Imagine cramming that into a pedal, and then running it into a pedal sized Poweramp (likely solid state). Showing up to a gig or rehearsal with nothing but two pedals, hooking it up to a cab, and hearing the deafening thunder of a 2203 in a tiny box. I don't play out anymore, but the one huge advantage to this setup is the heat reduction. I live in GA, where it's over 90° F all summer long, and a 100w tube amp makes for a lot of heat in a room far from the thermostat. Is that stomp box tagboard you use? I'm going to have to make a lot of these for different amps. Without the 6V6 power tube, Champ transformer could probably power at least 4 preamp tubes I am thinking. This is turning into quite an amp odyssey. I don't think I'm going to get voltages anywhere near these readings with a ~200v power supply. I think my preamp schematic assumed a 450v+ power supply. Johan, do you run your power supply straight into the tube plates? Or do you have a very small dropping resistor / plate resistor? Hook it up to the cathode follower anode,just before the eq. 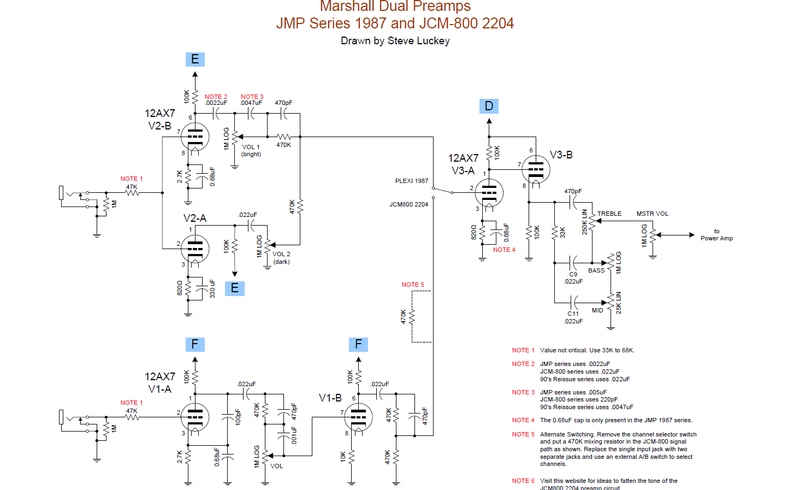 There is an old original schematic with voltage shart saying 290 volt for 2203 and 260 for 2204 if i remember correctly (Nothing suggests i do)but for a stand alone preamp with unknown power amp/speaker, you might want a little more drive/compression. .. But my laptop wall wart is actually over 19v...over 3amps. I don't understand math enough to get 12v from 19. EDIT: the inverter uses a MC34063 chip. datasheet says it can take up to 40vdc input so I should be good at 19v? Input filter cap looks like 35V rated. ebay info said 9v to 18volt but laptop supply runs at 18.5...over 19v due to line variation. In a few days ill have a PC power supply to play with...12v at many amps (likely enough to run a 50w amp I'd imagine...but not going to push it, nor do I have the OT for EL34s). It's still analysis paralysis at this point. I have PCB proto boards, including a vero type scratch trace board and box cap WIMAs to work with it. But I also have full size axial Illinois caps for the turret board. And the chinese were so nice as to not publish what layout they used to make it...so it's going to be a guessing game at first. Plan is to build 2204 preamps and play around with OWM (with swapped 0.022 and 0.0022uf caps swapped) to see how I like that as well. Once I get those stable, should be pretty easy to shoehorn in the "plexi" side of things for a clean channel. I have several possible chassis but none that will fit the turret board (except an old baking pan, or my class 5 which I really don't want to do right now). The baking pan might be good practice. Been watching videos on fabricating a chassis from sheet metal.